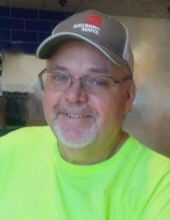 Mr. Johnnie Wesley Jessie of Summersville, Kentucky, son of the late Earl Jessie and Ernestine Edwards Jessie, was born on Wednesday, March 7, 1962 in Adair County, Kentucky and departed this life on Thursday, March 21, 2019 at his home. He was 57 years, and 14 days of age. He had made a profession of faith in Christ and was a member of the Greensburg Separate Baptist Church. He was a Dispatcher for the Green County 911 Center, was Unit 41 for the Greensburg/Green County Volunteer Fire Department where he served as training officer. He was a member of the Green County EMS, Campbellsville Dispatch Center, and Fort Knox EMS. Survived by his wife: Kathy Judd Jessie of Summersville, having united in marriage on May 8, 2004. Other survivors include a son: Jeremy Jessie and his girlfriend, Tara Hutcherson of Summersville; a daughter and son-in-law; Beverly and Bobby Edwards of Greensburg; a step-son and his wife: Jeremy and Heather Edwards of Greensburg; three grandchildren: Hallie Jessie, Jaydon Jessie and Kaylee Edwards; six step-grandchildren: Evelyn Edwards, Nathaniel Clark, Briley Edwards, Gage Edwards, Lexie Hutcherson, and Taygen Hutcherson; two brothers: Robert Jessie of Columbia, and David Jessie of Campbellsville; and a host of other relatives and friends. The funeral services for Mr. Johnnie Wesley Jessie will be conducted at 2:00 P.M., Central Time, Sunday, March 24, 2019 at the Cowherd and Parrott Funeral Home with burial to follow in the Campbellsville Memorial Gardens with Full Fire Fighter Honors. Visitation is requested from 3 P.M. until 8 P.M., Central Time, Saturday at the Cowherd and Parrott Funeral Home and after 7 A.M., Sunday until time of the funeral service. The family has asked that expressions of sympathy take the form of donations to the family burial expenses, which can be made at the funeral home. To plant a tree in memory of Johnnie Wesley Jessie, please visit our Tribute Store. "Email Address" would like to share the life celebration of Johnnie Wesley Jessie. Click on the "link" to go to share a favorite memory or leave a condolence message for the family.